Gold and silver are both precious metals; they are closely related in their chemical properties and both have a long history of serving as "monetary metals" for coins and bullion. It's not surprising that their prices would track closely in the same direction, although not perfectly so. 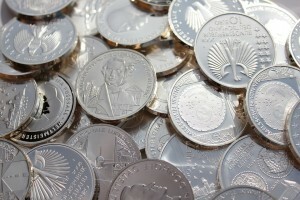 In some sense, you can think of gold as the bedrock of investment and finance while silver is the money of the people. As of Thursday afternoon, spot silver has advanced an impressive 15% thus far this year. That still trails behind gold's 20% rally to start the year, which is unusual. In general, silver is typically more volatile than its yellow cousin; it drops by more when the market is down, it rises by more when the market is up, and usually experiences bigger proportional swings up and down in the interim. All the same, gold and silver prices normally move in tandem. 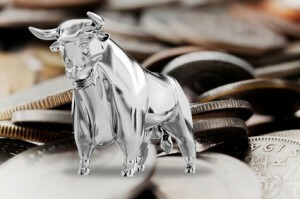 It appears that whatever disconnection in the marketplace between the two metals may be coming back into balance as silver "catches up," so to speak: Silver gained 2.75% on Thursday, finally crossing back above the $16 per ounce mark. This has pulled the gold-to-silver ratio down from its recent 10-year high. Nonetheless, the gold price has been proportionally higher than silver at historically high levels for all of 2016. The notion that silver is "The People's Money" has several components. Throughout history, it has always been the cheaper metal, more often used in commerce. In American history, it was one of the symbolic factors supporting the cause of the "little guy" in rural areas that did not want the emerging federal banking system to "hang" them "on a cross of gold." This remains true, even today. The volume of silver bullion that is purchased by the public vastly exceeds that of gold, even when their prices are taken into account. This is compounded by the fact that roughly half of the annually produced silver supply around the globe gets used up in industry, whereas this is hardly the case for gold. Here's another good example: with prices again hitting $16/oz, silver ETF holdings have risen to a 7-month high on the back of small-size purchases. These small buyers returning in earnest to the silver market helped these funds rebound from a 3-year low. To some, the chance to capitalize on silver's rally may seem to have passed, given that the argent metal was trading below $14/oz as recently as the beginning of January. Nonetheless, this "seller's remorse" is not set in stone. First of all, three quarters of the year remain, and it's difficult to rule out even further gains for the silver price over the course of the year. Moreover, anyone who has already built some substantial position in the precious metals can always use relative performance differences between gold and silver to play one metal off of the other. Depending upon which direction the gold-silver ratio is moving, you can simply sell ounces of one metal to buy quantities of its counterpart with that money, thus improving your portfolio's overall performance. This dynamic can sometimes be tricky to predict—but there's hardly any risk, given that you still end up with a nice pile of bullion in the worst-case scenario!